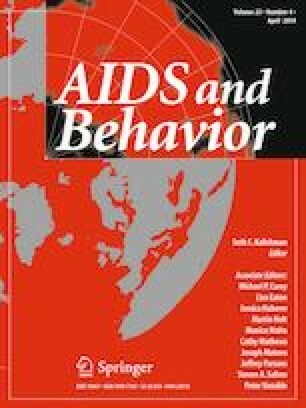 The online version of this article (doi: https://doi.org/10.1007/s10461-019-02488-7) contains supplementary material, which is available to authorized users. All authors take responsibility for and approve the final version of the manuscript. We thank the National Institute of Drug Abuse (NIDA) at the National Institutes of Health (NIH) (R01-DA030793), the Eunice Kennedy Shriver National Institute of Child Health and Human Development (K24-DA037101; K24-HD06920), the University of North Carolina Center for AIDS Research (CFAR) (P30 AI-50410), and the National Institute of Allergy and Infectious Diseases (NIAID) at the NIH (T32-AI007001) for their support of this work. The content is solely the responsibility of the authors and does not necessarily represent the official views of the National Institute on Drug Abuse or the National Institutes of Health. CEG, KK, PMF, and DAW contributed to acquisition of the data. JSG assisted with data management. BWP, CEG, SN and DAW conceived of the analysis. BLD and BWP designed and completed the analysis. BLD drafted the manuscript. BWP, CEG, KK, PMF, JCA, JSG, KAP, BLW, SN, and DAW assisted with the interpretation of the data and critically revised the manuscript for important intellectual content. The authors thank the TDCJ (including Allyson Glass, Scott Edmiston, Valla Kirby-Brossman; Frances Gattis; April Scott; Courtney Ross; Mandy Vance) and the NCDPS (including Paula Smith, Pamela Gibbs), particularly the discharge planning and clinic staff, as well as the participants for their generous contribution. We also thank the trial research staff including: UNC - Lisa McKeithan, Steve Bradley-Bull, Kemi Amola, Lynn Tillery, Makisha Ruffin, Angela Edwards, Katesha Peele, Neeve Neevel, Madeline McCrary, Elizabeth Roberts, Erika Hallback, and Sayaka Hino; TCU - Roxanne Muiruri, Molly McFatrich, Julie Gray, Scott Edmiston, Allyson Glass, Courtney Ross, Mandy Vance, Valla Kirby-Brossman, Elizabeth Larios, Laurence Misedah, and Bethany Evans. This research was supported by funding from the National Institute of Drug Abuse (NIDA) at the National Institutes of Health (NIH) (R01-DA030793) and the Eunice Kennedy Shriver National Institute of Child Health and Human Development (K24-DA037101; K24-HD06920). Additional support was provided by the University of North Carolina Center for AIDS Research (CFAR) (P30 AI-50410) and the National Institute of Allergy and Infectious Diseases (NIAID) at the NIH (T32-AI007001). The content is solely the responsibility of the authors and does not necessarily represent the official views of the National Institute on Drug Abuse or the National Institutes of Health.